This is the most famous lake in Goa and also one of the most popular tourist destinations on the itinerary of all the conducted sight-seeing tours. 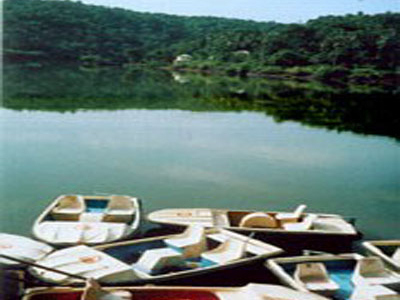 The lake is located in Bicholim taluka in north Goa, east of the market town of Mapusa. The region in which the lake is located, is mostly unspoilt countryside full of sleepy villages. The lake itself sits on wooded shores in a landscape of low hills. Birdlife is plentiful here, with a variety of birds making their home on the shores of the lake. The placid waters of this lake are ideal for boating. Small pedal operated boats are available for a charming boat ride on the lake. The lake has in its grounds a shady park which boasts of an excellent cafeteria and several other stalls, the most popular of which are the soft drink ones. Worth visiting nearby in the picturesque village of Mayem is the Kumbharwado where villagers belong mainly to the farming community. But they do not till the lands until after the celebration of the festival of Ganesh Chaturthi. They are engaged in an activity of an entirely different kind. Most families of the Kumbharwado locality make Ganesh idols out of terracotta which are shipped all around Goa for the festival. The idol making is an art passed on from generation to generation and produces some of the most beautiful and colorful idols in the state. Here's the our members favorite photos of "Lakes in Goa". Upload your photo of Mayem Lake! Raj Francis is the only Touristlink member to visit Mayem Lake. Have you been here? Click here to save it.